The American Heart Association® has recognized HDL as one of six independent risk factors that can positively impact heart health. Do You Know Your HDL? Take 2 tablets in the morning and 2 tablets in the evening. Do not use this product if you have a bleeding disorder, are taking blood thinning medication or are within a week of any surgical procedure. If pregnant, nursing, have a blood clotting disorder or are taking any medications, consult a healthcare professional before use. What is HDL or high density lipoprotein cholesterol? Cholesterol is a soft, waxy, fat-like substance found in every cell of the body. HDL is responsible for carrying cholesterol away from the arteries to the liver where it is eventually processed and eliminated from the body. 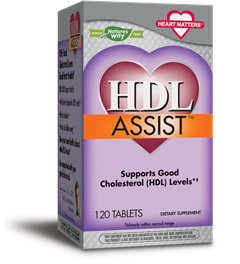 HDL levels are important indicators of healthy cardiovascular function. * In fact, even as little as a 1% increase in HDL levels can significantly support heart health. * For optimal heart health, it is recommended to have HDL levels above 60 mg/dL.